I don't make a lot of "drinks", so you probably won't ever see very many on my blog. With my meals, I prefer water and if I ever do need something to quench-my-thirst, I love Tropical Punch Kool-Aid - It is my favorite, but when I saw this Brazilian Lemonade, I knew I had to give it a try. Afterall, I did have a lot of limes, because my grocery store was out of single-limes, so I had to buy a big bag! 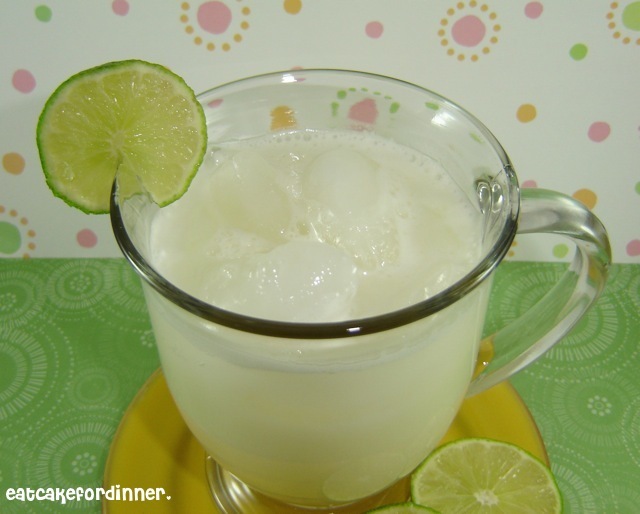 The recipe is interesting, because you use the entire lime, not just the lime juice and zest. The recipe recommends serving immediately and states that it does not keep very well. I made a batch early one Sunday morning and drank an entire glass immediately and I liked it. It is limey and refreshing. A few hours later, I poured myself another glass and it had a strange taste to it? So, follow the instructions and serve immediately. Don't make extra, planning to have leftover, because it will not taste nearly as good. I have never had the Brazilian Lemonade at Tucanos, so I have no idea how this compares. Wash limes thoroughly with soap (I just use hand-dishwashing soap or regular hand soap); you need the soap to get the wax and pesticides off of the limes because you’re using the WHOLE lime, baby. Cut the ends off the limes and then cut each lime into 8ths. Add 1/2 of the sugar water, place the lid on your blender, and pulse 5 times. Place a fine-mesh strainer over a pitcher (the one you’ll serve the lemonade in) and pour the blended mixture through the strainer and into the pitcher. Use a spoon to press the rest of the liquid into the pitcher. Dump the pulp and stuff in the strainer into the trash. Repeat with remaining limes and sugar water. Add sweetened condensed milk; DO NOT leave this step out unless you will die of a horrible sweetened condensed milk allergy because this is the secret ingredient! Serve immediately over lots of ice. This does not keep well, so don’t make this in advance (although you can cut the limes, mix the sugar water, and measure the sweetened condensed milk in advance). Serves 4, although I can pretty much guarantee you that people will want more; I usually plan on 1 1/2 servings at LEAST per person. Our Best Bites Tip: Smooth, thin-skinned limes are the juiciest and least bitter. It sure does look refreshing, good to know that it should be consumed immediately though. Thanks for the recipe and the advice! What an interesting idea! I rarely use limes, but do enjoy a slice in my diet Coke when we eat out. Anything with condensed milk is wonderful. Thanks for your tips.